Ryan Lumsden lines up to put. He’ll be in Northwestern’s lineup in this weekend’s tournament. 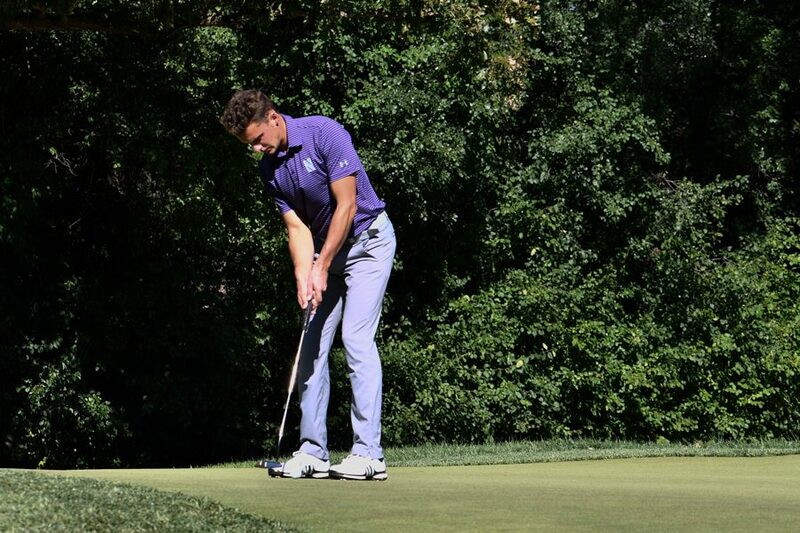 The last time Northwestern was competing on the links over three months ago, they had mixed results. Freshman David Nyfjäll won the individual competition — his second in a row — but the Wildcats finished in a disappointing third place. Now, NU is back on the golf course for the spring season and will open with the Big Ten Match Play Championship in Palm Coast, Florida this weekend. Senior Ryan Lumsden said he enjoys match play because every shot matters. The Cats earned the No. 2 seed in the 14-team field, with the seeding decided by the final Golfstat rankings from the fall season. The only team to be seeded above NU is down-state rival Illinois. As a top-two seed in the tournament, the Cats get a first-round bye into the quarterfinals. That means instead of starting the competition Friday at 8 am EST, NU does not begin until 1:30 pm, when it will play the winner of No. 7 Minnesota and No. 10 Maryland. The bye into the quarterfinals was a change made to the tournament this year, and coach David Inglis said it was a welcome change. But instead of sleeping in and spending the morning off the links, the Cats and the Fighting Illini will play an unofficial match as a warmup. An interesting aspect of the tournament is the links themselves. The Hammock Beach Resort has two courses that will host the Match Play competition — the Ocean Course and the Conservatory Course. However, NU hopes to only have to play one of them. The Cats’ exhibition against Illinois will be played on the Ocean Course and all non-consolidation matches after the first round will also be played on the Ocean Course. Designed by Jack Nicklaus, golf’s all-time leader in major titles, the Ocean Course is located right next to the Atlantic Ocean. NU spent time on Thursday practicing on the course, and Lumsden said the greens are in “great shape” and the fairways are firm. While the Cats will be able to spend their morning on the Ocean Course, the Minnesota and Maryland match will be played at the Conservatory Course, giving NU a step up. Inglis said the expected lineup for the Cats will be Lumsden, Nyfjäll, junior Everton Hawkins, sophomore Eric McIntosh, freshman Lucas Becht and senior Pete Griffith. Inglis said Hawkins is dealing with a back injury, and his status is a question mark. Hawkins said he will compete this weekend; however, he is unsure how many of the team’s matchups he will actually play in. The Cats have won four Big Ten Match Play championships. After winning three straight titles from 2010-12, NU won the 2017 championship by beating Penn State 3.5-2.5 in the final. Hawkins was a freshman on the 2017 team that finished in first. He hit the winning putt in the final round and won all three of his matchups in the tournament. Hawkins said the team is preparing very similarly to how it prepared two years ago.